This page mentions Iridium Next basics. It mentions features of Iridium Next and also mentions applications of Iridium Next system. It compares it with existing Iridium system. Recently SpaceX has launched satellites to complete about 20 in the new constellation orbit as per contract with Iridium Communications. Few more launches will complete total of 75 satellites in the new constellation. Out of these 66 satellites are operational and nine satellites are placed as spare satellites. Once these new satellites are placed in the orbit side of the old satellites; New satellite constellation will be operational. This new constellation will provide seamless transfer for its customers from aging Iridium constellation. Once the new constellation will be operational, the original satellites will be fired to lower their orbits for disposal. The system has been started in 2012 and will be fully operational by 2025. Following are the silent features of Iridium Next system. 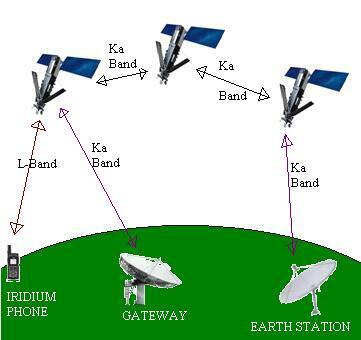 Refer Iridium Satellite System features>>. Following are the applications of Iridium Next System. • Instead of getting aeroplane location from ground stations, Aeroplane will provide its location to the ground stations with the help of onboard satellite transponder. The Iridium Next system will be very useful airport communication and air traffic control. • Satellites in the new constellation will have life span of about 20 years instead of 7 to 9 years lifespan of old satellites in original constellation.